Click on the thumbnail to view the enlarged image. 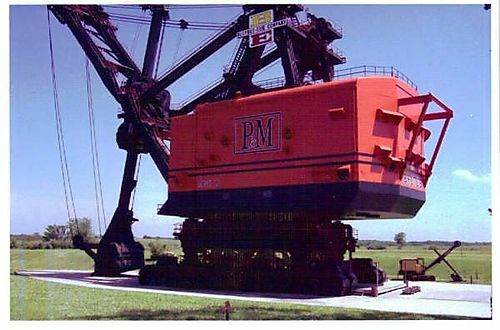 "Big Brutus was a coal shovel and when in operation generated 15,000 horsepower, weighed 11.7 million pounds and could scoop up 135 tons of coal at a time – in ONE SCOOP! Just think how much "BLUE BELL" that would be!!" Notice the regular size seam shovel on the back right of the pad where Brutus sits. Whoo-ee, that gives a good comparison for the size of BIG Brutus.